More than 600 exuberant attendees gathered in Denver on January 26 to honor and celebrate the 100th birthday of the First Lady of Audiology, Dr. Marion Downs. Marion Downs is the internationally acclaimed audiologist who, among her many significant contributions to helping persons with hearing loss, brought attention to the importance of early identification of hearing loss in newborns to medical and educational professionals around the world. 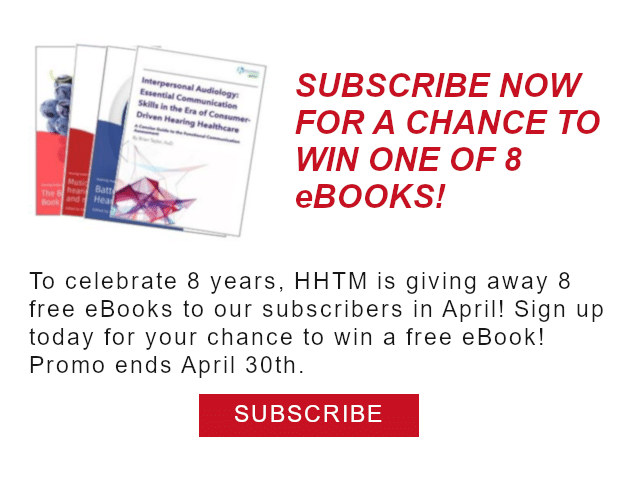 She is credited with establishing the current U.S. program that screens the hearing of nearly 4 million newborns a year prior to discharge from their birthing facilities. 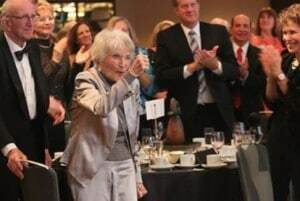 Greatly admired as a clinician, researcher, and educator, and a beloved figure in audiology and beyond, the remarkable centenarian traveled to Denver from her current home near Minneapolis to attend this celebratory gala held in her honor. 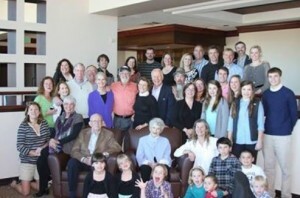 In addition to audiologists from all corners of the country, professional and personal friends, and other well-wishers, she was joined on her 100th birthday by a contingent of nearly 50 members of her family including, numerous great-grandchildren. The new centenarian is surrounded by her family. 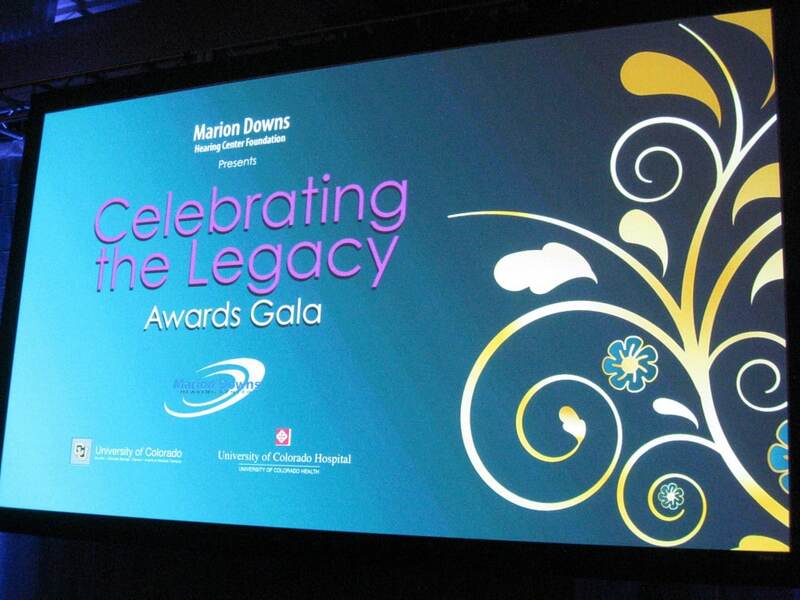 The birthday gala and celebration, sponsored by the Marion Downs Hearing Center Foundation, had a two-fold purpose: first, to recognize the tremendous impact and legacy of Marion Downs and, secondly, to raise funds to support the future Marion Downs Hearing Center, a multi-story building to be erected on the medical campus of the University of Colorado in Aurora. The evening included a number of fund-raising activities including a fanciful silent auction and a very successful live auction featuring, among other treasured items, a Denver Broncos Super Bowl Travel Package, a signed and framed Peyton Manning football jersey, and a Primetime Emmy Awards Travel Package to Los Angeles. The fund-raising effort was topped off by the surprise presentation of a $1 million donation from the Anschutz Foundation of Denver in support of the Marion Downs Hearing Center. 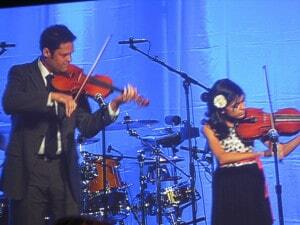 Justin Osmond and 10-year-old Isela Barron played a violin duet. The evening was filled with honored guests introduced by master of ceremonies John Schneider, the singer and actor who starred in the popular Dukes of Hazard TV series of the 1970s and ‘80s. Presentations to honor Marion Downs were made by Colorado Congress members Mike Coffman and Diana DeGette, and by the long-running TV talk show host, Larry King, who provided a special video birthday greeting for Marion. And then the music began. The featured entertainer was Donny Osmond, who took time from his successful Las Vegas show with his sister, Marie, to perform a number of songs and to relate personal stories from his 50 years in the entertainment world. Donny was joined by his brother, Merrill Osmond, who was the lead singer of the Osmond Brothers, who racked up a whopping 27 gold records, including five number one hits, during their peak years. The program also included a duet violin performance by Justin Osmond (nephew of Donny and son of Merrill) and 10-year-old Isela Barron, a patient at the Marion Downs Hearing Center. A toast to the century mark. 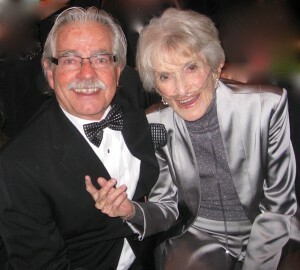 The star of the evening was, of course, the world’s foremost advocate for children with hearing loss, Dr. Marion Downs. “I have had a wonderful life, enriched by my personal and professional friendships and ever-expanding family. I want to express my profound thanks to all of you who have come from near and far to help me celebrate not only my 100th birthday, but also the culmination of my professional dream, the Marion Downs Hearing Center. As she moves into her 101st year, Marion continues to inspire with her vision, direction, and enthusiasm for life. She has changed the world for countless children, their families, and professionals. We hope that her 100th birthday brings her more of the joy, wisdom, hope, and love that she has always given away so freely. If you would like to show your appreciation to Marion Downs and join the growing list of donors to her legacy – the Marion Downs Hearing Center – please contact Kristi Frahm at 720/848-3042 to make a donation of any amount or contribute online at www.mariondowns.org. 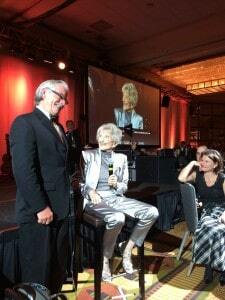 Jerry Northern introduced Marion Downs at the gala. Jerry Northern, PhD, worked with Marion Downs in the Audiology Center of the University of Colorado Hospital for nearly 40 years. Together they provided hearing services to thousands of patients of all ages, but are most noted for their contributions and work with infants and children with hearing loss. The sixth edition of their enduring classic textbook, Hearing in Children, will be available from Plural Publishers on February 28. Dr Marion Downs has been an incredible role model for all audiologists for decades . She makes me feel like I have miles to go before I sleep! Indeed. Lovely article. Amazing human being and role model for us all. Well said. A very remarkable person and friend.